At the same time, being an erudite, tattooed, modern Renaissance Man, he never bought into the whole God thing. Simply put, he's seen ghosts, but he hasn't seen Jesus. Corey especially can't find a reason why people do the insane things they do in HIS name. That's where everything really gets interesting. 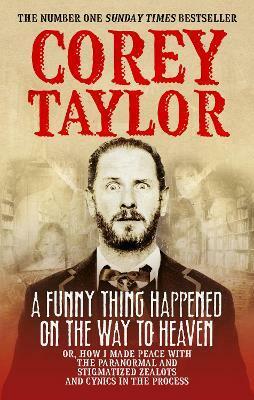 His second book, A Funny Thing Happened on the Way to Heaven, compiles Corey's most intimate, incredible, and insane moments with the supernatural. His memories are as vivid as they are vicious. As he recounts these stories, he questions the validity of religious belief systems and two-thousand-year-old dogma. As always his rapid-fire writing, razor sharp sense of humour, unbridled honesty, and cosy anecdotes make quite the case for his point. You might end up believing him or not. That's up to you, of course. Either way, you're in for a hell of ride. "He’s done it again, folks, put out a piece of art and work that will leave you speechless and thinking harder than you have in awhile. Taylor’s second book…is probably more highly-anticipated than his first book and will have your hair standing on end, chills down your spine while making you laugh hysterically at some parts…A well-written, in-depth, intellectual and bone-chilling piece of work that will go down in history as one of the best books written by a metal singer of all time." Corey Taylor is an American musician best known as the lead singer of hard rock bands Slipknot and Stone Sour, which together have sold over 10 million records. Taylor has been nominated for 10 Grammies and has won one. He has also written his own monthly column for UK magazine, Rock Sound, since 2001. His also the author of the Sunday Times bestseller Seven Deadly Sins.